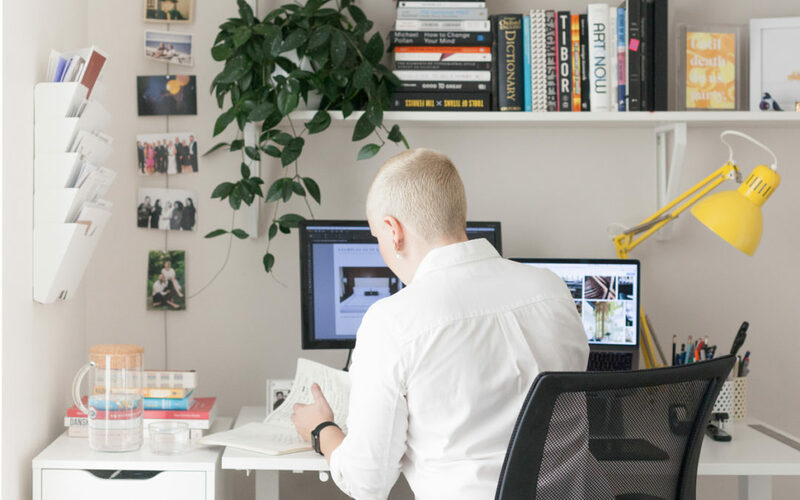 When I graduated from design school, my life goal was to one day own a bustling, buzzing design agency full of other fun creative people doing amazing work for the best and highest paying clients in town (duh). But first I wanted to gain experience in the workplace and learn what I could from other businesses and mentors. This dream was shared by many of my friends and peers, some of whom went for it right out of the gates and started their own companies and others, like me, went to get their first office job and work their way up. Fast forward ten years and 4 jobs later, including working in-house for brands like lululemon athletica and Luvo inc. and I still hadn’t hit that goal, but I still liked what I was doing. I liked getting a paycheck every two weeks and as an extrovert I loved being around and leading a team. And then one day, which seems to happen at every job at some point or another, it was time to move on. I had been in my role as a Creative Director for Luvo Inc. for over 3 years and I was getting “the itch”. But this time I took the leap and started working for myself. It probably helped that by this time, many of my friends owned their own businesses and I felt pressure to be an entrepreneur. Not a bad pressure but that “be your own boss” voice was strong and gaining in popularity, especially among my female friends. In fact, in BC women own more than 1 third of all small businesses in BC and Canada. As one after another of my peers peeled off to start their own thing, I wasn’t at all surprised by that. I quickly got my footing and hustled enough work to make my mortgage payments and get food on the table. I registered my business, hit up social and networking events, and got an accountant to make sure I wasn’t screwing up all that tax stuff. I got a splash page up that showcased my new agency and the services we offered. I was officially a business. I had officially hit the goal I had set so many years before. But something didn’t feel right. Sure, I had plenty of contractors my first year from photographers, graphic designers, stylists and website developers, but at the end of the day it was really just me in my home office with my dog Ruthie. I felt like by saying I was an agency, I was lying to people. Imposter syndrome was creeping in and on top of that I was really lonely. It’s all smoke and mirrors right? Fake it ‘till you make it? So I did what I always do when I don’t know what I’m doing and I spoke with friends and reached out to people who might have shared experiences. One of those people in particular was Steph Corker of The Corker Co. who was a colleague of mine at lululemon. Her advice to me was that “It doesn’t matter what you’re doing as long as you give it 100%. Maybe today you’re running your own business and tomorrow you get a job offer and you decide to take it, there is nothing wrong with that”. This was exactly what I needed to hear. So, I’ve been running my freelance biz, all the while keeping my eyes out for a possible role at another company. I realized in the process that having my agency site, as well as my personal portfolio site, has been nothing short of confusing for everyone including me. I realized people weren’t hiring me because of my “agency” they were hiring me to do the work because of a personal connection and because they want to work with me. As a freelancer or small business owner you’re the face of your business and it’s important to represent yourself as clearly and confidently as you possible can. For me, this means scrapping the agency vibe, and stepping into who I am, as authentically and honestly as possible.